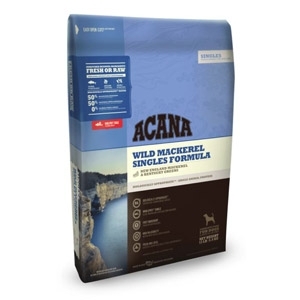 Loaded with 50% wild Atlantic mackerel to nourish your dog according to his evolutionary needs, ACANA Wild Mackerel contains one single, easily digestible animal protein. Wild and sustainably caught from New England waters, our richly nourishing Atlantic mackerel arrives fresh and whole, including fish, organs and cartilage to nourish your dog completely and naturally. Generous infusions of freeze-dried liver make ACANA a perfect choice for fussy dogs.